The Firm serves as turn-key program and construction manager on large and complex engineering projects by providing a full service capability of comprehensive services to its clients. 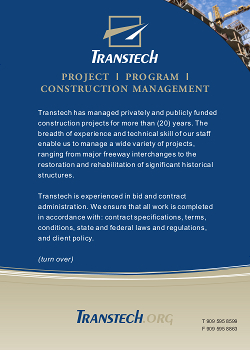 Transtech has lead initial planning and design, systems engineering and technical assistance, permitting, program and construction management, and operations and maintenance services for various projects. Many of our projects have involved close coordination with Caltrans and encroachment permit processing and approval. Transtech staff has worked in the capacities as Construction Manager, Resident Engineer, and Construction Inspector in both public and privately funded projects. Our extensive experience coupled with our in-house QA/QC program prevents design errors and change orders. Our approach is to provide proactive management to control every aspect of a project in detail to identify potential issues and problems in advance and take corrective actions before they become problems. In just the past 3 years, our staff has managed over 25 federally funded projects through Caltrans Local Assistance in compliance with Local Assistance Procedures Manual as required in federally funded projects. Services includes obtaining E-76 authorization for each project phase as necessary, preparing all necessary paper work and approval process, fund reimbursement, labor compliance and contract administration throughout the project, from PE through CE, as well as serving as Resident Engineer and Inspector during construction.